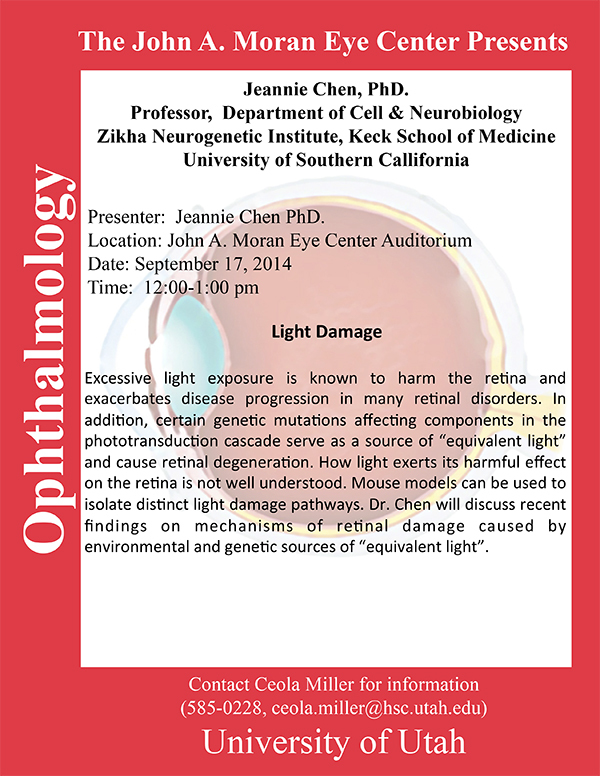 Jeannie Chen, Professor in the Department of Cell and Neurobiology, the Zikha Neurogenetic Institute, Keck School of Medicine, University of Southern California will present a seminar at noon on Wednesday, September 17th in the Moran Eye Center auditorium on Light Damage. Abstract: Excessive light exposure is known to harm the retina and exacerbates disease progression in many retinal disorders. In addition, certain genetic mutations affec6ng components in the phototransduction cascade serve as a source of “equivalent light” and cause retinal degenera6on. How light exerts its harmful effect on the retina is not well understood. Mouse models can be used to isolate distinct light damage pathways. Dr. Chen will discuss recent findings on mechanisms of retinal damage caused by environmental and genetic sources of “equivalent light”.